Gifts Men Will Actually Like! Microsoft’s latest Surface Pro 3 claims to be the “tablet that replaces your laptop.” Running Windows 8.1 Pro on a larger 12″ screen, and only weighing 1.76 lbs, this tablet is both lightweight and powerful. 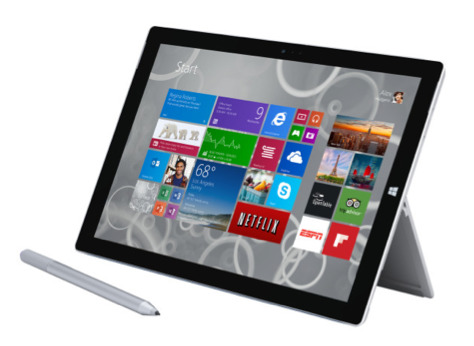 It runs on an Intel Core Processor and comes with the Surface Pen for easy note-taking. If you truly want a laptop replacement though, you’ll need to purchase the optional cover/keyboard. Looking For Men Gifts? Well, this is the right place! Find great gifts for buddies, bros, boyfriends, husbands, dads, and all the other cool men in your life! This site strives to find interesting, cool, geeky, uncommon, unique, and stylish gift ideas for the modern man - gifts men will actually like! Stop stressing out over finding the right gift. We'll help you find it here. New products are added regularly, so bookmark, follow us, and come back often. Browse the cool products, shop, and let the man enjoy!